ND Tiwari had refused to accept Rohit as his son and gave up only after a paternity battle in the courts for six years. Rohit Shekhar Tiwari, the son of late Congress veteran ND Tiwari, died under mysterious circumstances in New Delhi on Tuesday. He was declared brought dead at Max Hospital in Saket. According to police, a call was made to the PCR from his Defence Colony residence that he was bleeding profusely from his nose. "We received an emergency call from the residence of Rohit Shekhar Tiwari at 4.41 pm this afternoon. An ambulance brought him to Max Hospital, Saket, where he was declared brought dead at the hospital emergency. As per the established procedure, we have informed the authorities. We express condolences at the passing away of Mr Tiwari," said a statement issued by the Max Hospital. Rohit's mother Ujjwala said that he was depressed for a long time. "There are a few people responsible for the same. I will reveal the names of the people who caused him depression," Rohit's mother said. The initial police probe has revealed that no external injuries were there on Rohit's body. Who was Rohit Shekhar Tiwari? The 40-year-old, a resident of South Delhi, came to the limelight through a long drawn paternity battle with his biological father ND Tiwari, who was the former Chief Minister of Uttar Pradesh and Uttarakhand. ND Tiwari had refused to accept Rohit as his son which made the battle hog the media limelight for years. In 2007, Rohit had filed a paternity suit against ND Tiwari which was withdrawn due to some technical errors. He filed it again the following year. It took the veteran Congress leaders six years to accept Rohit as his biological son after continuous denials. The former UP Chief Minister even refused to give his blood samples for DNA profiling although both Rohit and his mother Ujjwala had submitted their samples in 2012. The late political leader even did not acknowledge the various state court rulings against him and the matter eventually went to the Supreme Court. Finally, ND Tiwari submitted his blood samples at his residence in Dehradun in 2013 which proved his biological link with Rohit. He ended up accepting Rohit as his son. 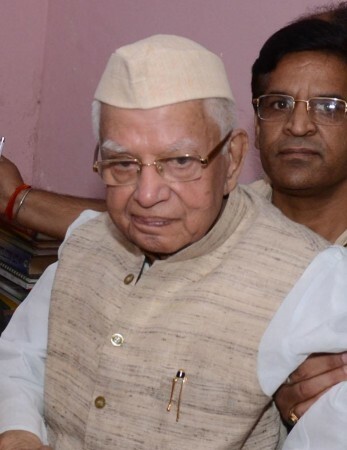 ND Tiwari died last year at the age of 93. Rohit, during the years of his paternity battle with his father, had famously said, "I am not the illegitimate son. He is my illegitimate father. And his troubles have just begun."